Oh the magic of Fraises des Bois! 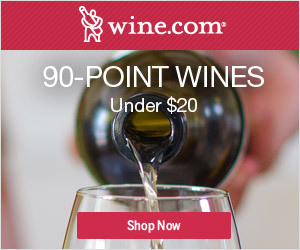 To me, they look as if they belong at the center of a tiny table in an enchanted forest; one set just for leprechauns, fairies, nymphs and elves. 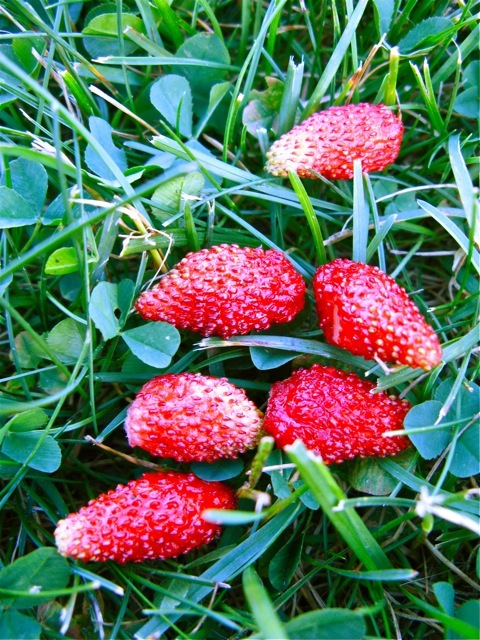 Alpine strawberries (Fragaria vesca) are fragrant, delicious and easy to grow. Sometimes called ‘the wood strawberry’, this rose-relative is a separate species from the common garden strawberry, (Fragaria x ananassa), and is native to North America, Europe, northern Africa and some parts of Asia. Unlike their runner-forming cousins, these lovely mounded plants produce fruit throughout the growing season – spring to fall. 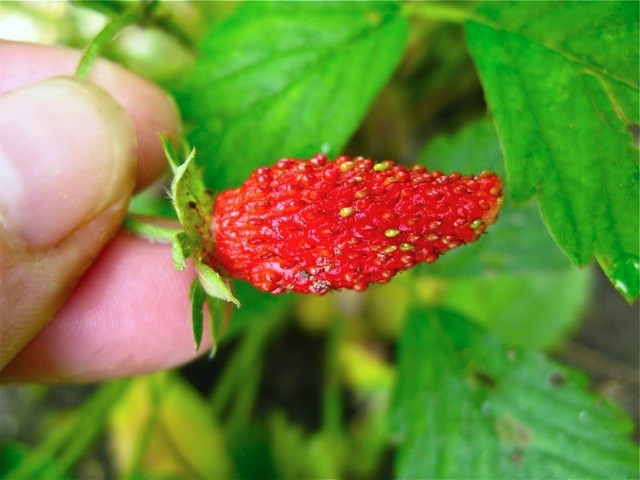 Many cultivars are available, including the delightful red ‘Alexandra’ and ‘Mignonette’, and for the more kaleidoscopic plate, there are even white and yellow alpine strawberries! Strawberries of all kinds are best planted out to the garden in early spring – but it is important to prepare the site well in advance (unless you are growing in containers). So if you would like to grow alpines in your potager next year – read on…. 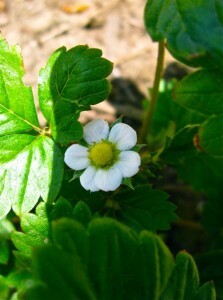 Competition for alpine strawberries comes in many forms; from weeds and insects to chipmunks, mice and birds. In my garden, the boisterous mocking bird clan living in the adjacent scrub seems particularly interested my strawberry crop this year. I do love their singing and bug catching, but I wish the mocking birds, robins and other winged-robbers would stay away from my strawberries! Now, don’t you feel too bad for my feathered friends – they have plenty of wild elderberries (Samubus canadensis), bramble berries and bugs to feast upon. If birds are snagging your berries, you can always cover them with safe Bird Netting, which allows air flow and pollinating bees to fly in and out. Alternately you could use insect pop-ups (such as those linked below) set in place when berries are close to harvest, and then removed at intervals for critical wind and bee pollination. 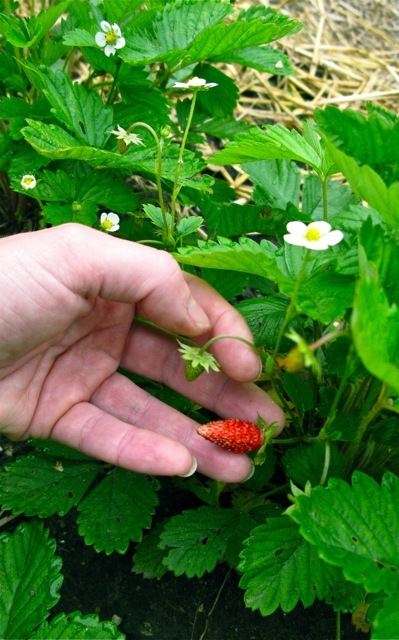 Slugs can be a real problem during rainy periods (copper edged raised beds, beer traps and diatomaceous earth are some commonly used deterrents), and insects –particularly sap beetles, tarnished plant bugs and bud weevils — are always an issue with strawberries of all kinds. Never apply an insecticide, even an organic insecticide, during bloom periods, as you will kill beneficial insects (including our precious honeybees) along with the less desirable, ‘bad bugs’. For backyard berry growers, I advise hand-picking insects and the limited use of row covers (see below) when berries are close to ripe. 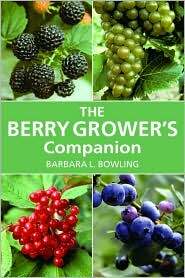 For more on berry growing, check out my review of Barbara Bowlings excellent Berry Grower’s Companion (linked here) available through Barnes & Noble online. And say tuned… More berry growing tips will be coming soon! 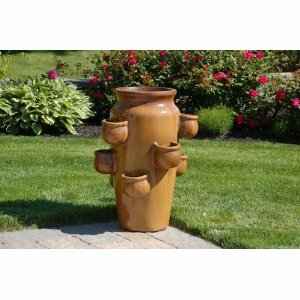 Containers with pockets, like the one pictured from Amazon above, are a great way to grow alpine strawberries. 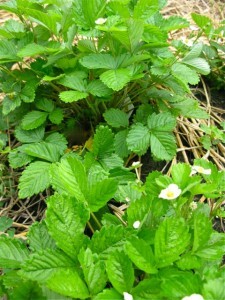 You are currently browsing entries tagged with alpine strawberry growing at The Gardener's Eden.